The Aztec Empire was a class society where differences between different social classes were strictly maintained. The nobles naturally had more privileges compared to the common people. Just like everything else, there was a clear difference between Aztec homes for the nobles and the ones for the common people. Aztec homes for the nobles were stone structures which were spacious and well decorated. On the other hand, Aztec homes for the common people were relatively smaller and simpler. But various elements were also common between Aztec homes for nobles and the commoners. 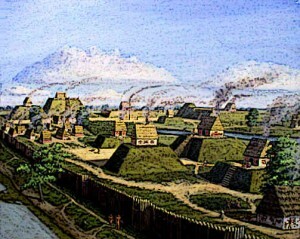 Aztec Homes were built on Platform Mounds which were usually steep four-sided truncated pyramids. 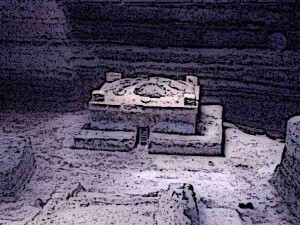 Aztecs made use of a variety of building materials in the construction of Aztec homes. These materials included locally found materials as well as the ones that were imported. Among the local materials, wood, stone, and straw were most commonly used while imported materials for Aztec homes included lime plaster for walls or floors. Wood, stone, and clay were mainly used for the walls while straw was often used for roofs. The Aztecs made adobe bricks which were also used in the construction of Aztec homes, particularly the homes of the nobles. These bricks were made from sand, clay, water, and straw. Floors of common houses were usually just dust while those of the nobles would usually be plastered or made of stone. Aztecs used fairly uniform construction methods to built Aztec homes. For instance, it was a common practice to dig a trench at the place where the walls would be constructed. After that, stone wall foundations were erected from the trench in order to provide a solid base. These stone wall foundations went up about .9 meters after which abode bricks were used in further construction. Aztec homes for the nobles had close-fitting stones and thick walls which made them very strong. Similarly, various layers of closely-fitting stones were used to make the floors. Sometimes, Aztecs also made terraced roofs which were later on used to attack the Spaniards. The homes of Aztec nobility were built with steam baths in them. Various similarities existed between the layouts of Aztec homes. Typically, the layout of Aztec homes was around 15 to 25 square meters. Houses of the nobles were usually large in size and lavishly decorated. An important feature of the layout of Aztec homes for the common people was the peaked straw roof. While the common practice was to build houses on the ground, sometimes they were also built on raised platforms. An important element of the layout of Aztec homes for the nobles was a garden attached to the home. Aztec homes for the nobles were naturally larger and better constructed than Aztec homes for the common people. Some nobles had homes of two floors with a central courtyard. Most of the nobles also included a garden in their homes with a lot of flowers. Materials used in the construction of Aztec homes for the nobles were relatively expensive. Further, instead of the straw roofs found in the Aztec homes for the common people, the roofs of Aztec homes for the nobles were made of stone. Nobles were also allowed to decorate their homes lavishly unlike the Aztec commoners. Aztec homes for the common people were smaller and built from less expensive materials. A standard Aztec home for commoners would consist of one large room which was occasionally accompanied with an additional small room. In one of the walls, a small space was retained for religious shrines since religious worship was part of everyday life in the Aztec Empire. Aztec homes for the common people sometimes also had a separate room for steam baths. Unlike Aztec homes for the nobles, the homes of the common people had only one floor. Daily life in Aztec homes varied depending on the social status and profession of the inhabitants. For the common families, men spent a good part of their daily life in outdoor professions which could be farming, trading, hunting, and others. More often than not, men were away fighting in important battles. Daily life of women, on the other hand, mainly consisted of dealing with the household chores such as cooking, sewing, and taking care of pets. Daily life of the nobles was much easier and there was more leisure time. Some nobles spent a good part of their daily life in administrative tasks such as looking after their land or managing the collection of tributes. 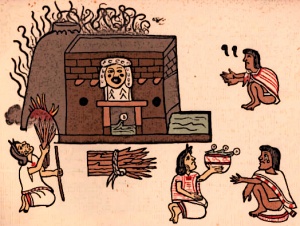 One of the usual elements of Aztec homes was the traditional steam bath called Temazcal. It was an enclosed structure with a small pit at the centre and an opening. The pit contained hot volcanic rocks which were used to heat water and produce steam. These traditional steam baths were used for both healing and ritual purposes and had existed in the Mesoamerican cultures for hundreds of years even before the Aztec Empire. Steam baths were thought to purify the soul after any exertion such as a battle or a ceremonial ball games. Additionally, it was thought to heal the sick and improve health. Due to this importance of the steam baths, these baths were included not only in Aztec homes for the nobles but also in Aztec homes for the common people. Aztec homes reflected the differences between different social classes of the empire. Aztec homes of the common people were quite simple and local materials were used in the construction of these homes. These materials included wood, stone, and straw. Aztec homes for the nobles, on the other hand, were built from more expensive materials and better construction techniques were used in order to make sturdy homes. Adobe brick was one of the most common construction materials used in Aztec homes, particularly in the homes of the nobles. Nobles also had gardens attached with their homes while steam baths were found not only in the homes of the nobles but also of the common people. This was because the Aztecs associated healing powers with the steam bath. Finally, unlike the common people, nobles were allowed to lavishly decorate their homes.